"And then I looked down. I know I shouldn't have, but I looked down." The bearded man loosened the neck of his robe. He was sweating and breathing quickly. "It must have been 200 feet to the bottom. All I was thinking was, I don't want to jump, I don't want to jump, but I kept getting closer to the edge. I'm supposed to be brave, you know, but this wasn't like combat." 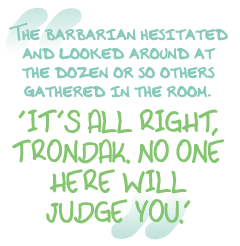 The barbarian raised his hands to his forehead, and Brandic thought he heard a sobbing sound. A female archer to the man's left laid a hand on his shoulder. "And then what happened?" asked another man, clad head to foot in black. "I- I jumped. Screamed the whole way down." "And then?" asked the man in black. The barbarian hesitated and looked around at the dozen or so others gathered in the room. "It's all right, Trondak. No one here will judge you." Trondak cleared his throat and seemed to gain a little strength. "I died. Splattered all over the stones. Resurrected at a graveyard less than a hundred yards away, then I was off to Bluerock Keep. All because it was a little faster than riding three minutes south to the footpath that leads down the cliffs." "Damn the Controllers! Damn them all!" shouted an angry looking bard. Brandic turned to the man at his side. "I'm not sure this is a good idea, Graylock." "Dr. Andophilus works wonders. I've been coming here for months and wouldn't miss a session for the world." "Alright, I'll give it a chance." As Brandic and Graylock entered the room, all eyes turned toward them, and the dozen or so participants greeted Graylock in unison. Their glances then turned to Brandic with a mixture of suspicion and contempt. Brandic sighed; it was the usual reaction when an expert thief showed up anywhere. "Relax, everyone. He's combat specced," said Graylock. The group settled a bit, although Brandic noticed a few purses clutched a little more tightly. Dr. Andophilus motioned them toward to two empty chairs, then directed his attention at a man in a long brown robe. "In our last session, Corallo was talking about his issues with intimacy. Would you care to continue, Corallo?" "Issues? What issues? I'm a priest. Celibate! I don't have any issues with intimacy. What I want is to be able to have some issues." "You're not missing anything," said a slim elfin woman. "Have you even seen what happens when we take our clothes off? Undergarments. All the time. Like they're tattooed on." The priest slumped back in his chair as the elf continued. "Anyway, I have my own issues." "Go on, Telestra," said the doctor.